From SAE - Automotive Engineering International. "Nearly four years ago, they decided that the GT-R would have a six-speed dual-clutch transmission (DCT) driving a rear-mounted transaxle—a complete departure from the front-mounted gearbox in the iconic Skyline models that preceded the new GT-R. Equally fresh was the decision to go outside for transmission-design expertise—in this case BorgWarner, which partnered with Nissan's keiretsu gearbox supplier, Aichi." 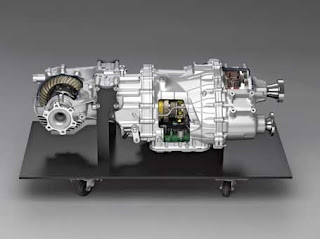 "The Nissan rear-wheel-drive DCT transaxle is the first of its kind, but Martin noted that others are in the pipeline. It incorporates the gear-driven power takeoff for the front axle within the transaxle. This mandated a "very tight" packaging job because the GT-R is a 2+2 coupe—the rear axle sits well behind the input flange. The countershaft is positioned down low and to the right side of the vehicle, to orient the power takeoff to the front. The clutch is similar to typical wet clutches in plantetary automatics, upscaled to handle the additional input torque and power level and given adequate cooling flow for maximum heat rejection, observed Blakely. He added that the friction materials were developed specifically for the GT-R program and offer the highest performance capability of any in BorgWarner's extensive range. A major challenge was keeping overall mass down without resorting to a magnesium case (the GT-R's is aluminum). "We were looking at individual parts and how we could reduce their weight by grams, while providing the strength required," Martin said. The unit's mass as installed in the car is approximately 258 lb (117 kg)." For comparisions sake R32/R33/R34 transmission/transfercase assembly weigh about 150 lbs, the rear member is about 50 lbs.